Ringing Cedars Oil promotes prolongation of life. According to the conclusions of a new scientific study present by Ringing Cedars of Russia.org the Ringing Cedars Oil, also known as Siberian Cedar Nut Oil from the Ringing Cedars of Russia company, is an indispensable food product in every day life as it appears to be the richest natural source of polyunsaturated fatty acids. Scientists discovered that omega-3 and omega-6 unsaturated fatty acid families found in Ringing Cedars Oil - also called the essential fatty acids - prevent atherosclerosis development, lower bad cholesterol in blood, possess anti-inflammatory properties and promote prolongation of life. 1. Ringing Cedars Oil constitutes a prophylactic measure against atherosclerosis (the cause of one out of every two deaths!). In the course of our entire lifespan a fatty substance is deposited on the walls of our vessels: bad cholesterol. At first, this results in the tissues and organs of our body receiving an insufficient amount of fresh blood, and the body begins little by little to become decrepit. In the end, the process may terminate with the complete obstruction of the vessels. At worst, the obstruction of the coronary arteries can lead to death from a heart attack; the obstruction of the vessels of the brain can lead to a stroke (cerebral hemorrhage); and the obstruction of the vessels of the extremities can lead to gangrene with the possibility of amputation. Unfortunately, heart attacks and strokes are affecting ever younger individuals. "Like dissolves like" is often heard from natural health practitioners. "And so, there is a way to dissolve cholesterol deposits and to prevent cholesterol from being deposited in the future. To accomplish this, we need only to act on the fatty cholesterol with another, more active fat! These super-active fats include precisely polyunsaturated fatty acids found in Ringing Cedars Oil" - says Dr. Michael Sobolev, the study coordinator. In childhood I played table tennis. The success of the player in this sport strongly depends on the ability to put a spin on the ball - it makes it very difficult for the opponent to return. It is important here that the rubber covering on the paddle is perfectly clean and "clings" well. Over time, the covering becomes dirty and greasy, and putting a spin on the ball becomes impossible. My older friends suggested that I rub the covering with Siberian Cedar Nut Oil (an active fat), place the paddle in a plastic bag overnight, and in the morning wash the covering with soap. Indeed, after this procedure, the coverings were like new. This made a strong impression on me at the time, all the more so because good coverings were very expensive, and the ability to transform them in such a simple way seemed to be a miracle. But in principle, it was all very simple: the more active fat dissolved the fat on the coverings and, together with it, all the dirt. The situation is exactly the same with our vessels. The active polyunsaturated fatty acids of Siberian Cedar Nut Oil (omega-3 acids), taken regularly, dissolve cholesterol deposits on the walls of our vessels, and a person will never be taken ill with atherosclerosis! 2. Unsaturated fatty acids are the building material of the cells. The casings of our cells, that is, the membranes, mainly consist precisely of polyunsaturated fatty acids. During the course of our vital activities, the membranes wear out, but are constantly renewed with the help of the "building materials" present in the organism. Polyunsaturated fatty acids are the most important of these. In the course of the study the scientists determined that, in the event of a lack of polyunsaturated fatty acids, the cells regenerate more poorly, and are more quickly destroyed and aged. Especially dangerous is a deficiency of unsaturated fatty acids for the most delicate and vulnerable cells of the vessels of the brain and heart, and the heart itself. 3. Ringing Cedars Oil is prophylaxis against sudden death from cardiac arrest. Scientists from the National Institute of Gerontology write: "At the present time, a connection has been demonstrated between the use of polyunsaturated fatty acids from natural products (Siberian Cedar Nut Oil contains unsaturated fatty acids - note R.D.) and so-called sudden death, which is usually regarded as a manifestation of acute cardiovascular pathology. In the USA, for example, it is well known that more than half of those who die suddenly did not have a history of cardiovascular disease, so therefore a practically universal prophylaxis is the most expedient course. It has been proven that even one dose of polyunsaturated fatty acids from natural products per week reduces the frequency of sudden death more than twofold. The presumptive influence of polyunsaturated fatty acids in the diet is a prophylactic measure for ventricular arrhythmias, myocardial hypoxia, and balancing the electrolyte metabolism and acid-base equilibrium." Indeed, numerous sources indicate that a large number of people who died suddenly from cardiac arrest did not have any suspicion about possible problems with their heart. The scientists conclude that, if the one-time use of polyunsaturated fatty acids from natural products in a week reduces the risk of sudden death more than twofold, the regular use of Ringing Cedars Oil will provide much more benefit! - it possess a moderate anti-oxidant effect. The researches also emphasize that the ideal ratio, for human health, of omega-3 and omega-6 fatty acid families is contained in the Ringing Cedars Oil. Moreover, the Ringing Cedars Oil is considered to be the richest source of polyunsaturated fatty acids. In a word, the use of Ringing Cedars Oil is extremely important, beneficial, and vitally essential for normal body functioning. 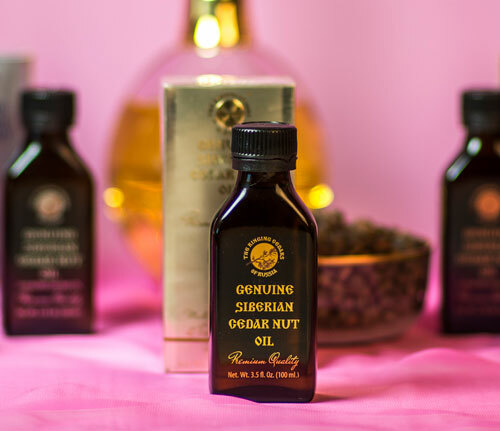 Many specialists regard Siberian Cedar Nut Oil as one of the most effective substances for the prolongation of life and preventive treatment for a variety of diseases! It only can be added that polyunsaturated fatty acids are not synthesized in the body and, just as several dozen other elements, must necessarily come from the outside. Ringing Cedars Oil may be used at any age (the earlier, the better). The effective dose is up to several grams in a twenty-four hour period. There are no side effects or contraindications - this is, after all, a natural product. A course of treatment should last one to two months, with two to three courses of treatment in a year.